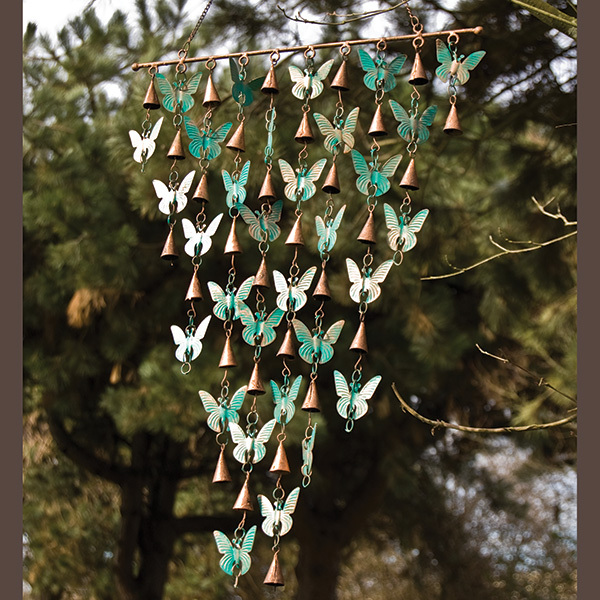 This large chime is composed of thirty each of green butterflies and rustic cone bells. These cones are made by artisans in India using an age-old technique of metal-work (metal is beat into shape by hand, then buried under the hot sand kiln). This gives each bell a unique patina and beautiful round tone. 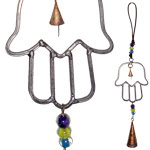 All of these are brought together in an alternating pattern, held by a wide metal rod and chain. 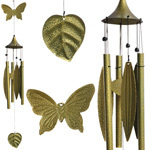 When the breeze blows, this chime creates a light tinkling sound. 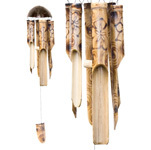 Wind chimes have long been used, since ancient culture, to protect the inhabitants of a home. Tones have a healing effect on our bodies, calm our minds and awaken our spirits. The resonance and vibration of sound releases stress and emotional blockages in the body. The calming of mind expands conscious awareness and connection with spirit. Wind chimes thereby help enhance the mind/body/spirit connection bringing us a sense of peace and well being.